The Samoyed was named after a nomadic Inuit tribe from northern Siberia in Russia, called the Samoyede people. 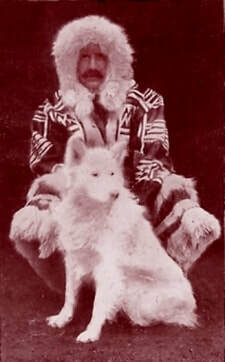 The Samoyede people were a gentle, nomadic tribe of family groups, that were accompanied everywhere by their dogs. They used the dogs to herd reindeer, pull sleds loaded with goods, and keep them warm in the frigid Siberian winters. The dogs were also used to baby-sit the Inuit children and were brought into their chooms (or tents) at night to keep the families warm. It was this close bond over thousands of years that made the Samoyed such a people loving, family orientated dog. The temperament of the well-bred Samoyed is a reflection of the breed's beginning: brought up within the family, eating at the campfire, snuggling in the beds, this dog is the ultimate companion, gentle with family members and happy to work. The Samoyed is charming, intelligent, active and playful through to old age; he is amazingly comical, yet thoughtfully sensitive. What sets this breed apart, aside from their magnificent beauty, is their love for all people. Thus the Samoyed is not a guard dog. He can however be a good watchdog. They will bark to alert you to someone coming. The Samoyed is an exuberant, independent and intelligent natured dog. The constant companionship with man through the years, has given the Samoyed an uncanny human understanding. His guarding of reindeer, requiring always a protector, never a killer, has developed a disposition in the breed unique in the canine world. A Samoyed’s main objective in life is to sleep by his owners. He needs to be an integral part of your family. They are a human-oriented breed, and want to be with their people inside or where ever their people happen to be at any given time. The affectionate Samoyed will be your friend for life! If you are looking for a dog to put out in the backyard to greet as time permits, you are looking into the wrong breed. An ignored Sammie equals a bored Sammie resulting in behavioural problems. They are a highly intelligent breed, which is sometimes confused with disobedience or stubbornness when it comes to obedience or other types of training. You can look into the eyes of the Sammie and know the lights are on...they make decisions. The best way to train the happy and fun loving Samoyed is with a lot of patience, praise and consistency much like you would do with your human children. Training needs to be fun for the Samoyed. The Samoyed is a dog who requires adequate exercise. They are an active working dog; although, not high strung. They will exercise inside and/or outdoors. 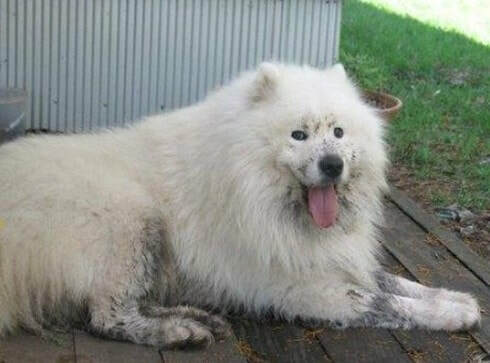 A Samoyed is a natural born digger. If you are a gardening enthusiast I don’t recommend a Samoyed unless you keep him in a separate area. I have known people to describe their backyard as a moon crater. It is a Samoyeds natural instinct to make “beds” for it self. In the arctic conditions they would dig hollows to protect themselves from the climate. In Australia they tend to dig shallow ditches to find that cooler wetter ground and make themselves as comfortable as possible. 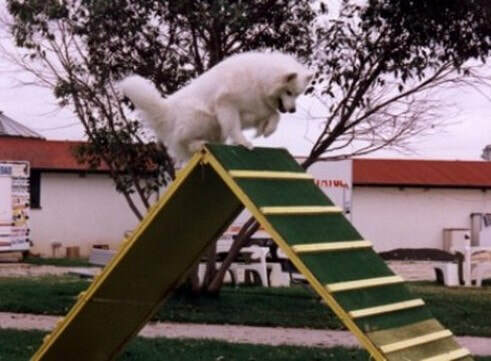 Samoyeds are naturals when it comes to dog sports, and will thrive on the stimulation and adrenaline rush of activities like obedience training and agility. There is also a sledding competition held annually during winter. Breeders warn that without the stimulation of daily exercise and people contact, the Samoyed will become a shadow of its true self and will fall into a depressed state. This can lead to unruly behavior, as well as a tendency to escape from the yard. As with all dogs, early socialisation and training is a must with the Samoyed to ensure it develops good social skills. The Samoyed is actually a rugged, compact working dog of both dignity and grace. He is a double-coated breed with a softer undercoat and a harsher standoffish outer coat. The Samoyed coat can be white, cream or biscuit or a combination of any of the three. Any colour other than listed or blue eyes are faults in the Samoyed. The Samoyed is, in spite of what you may have heard, a breed that does well in all elements. While they prefer the cooler climates; the Samoyed acclimatizes well to the warmer climates. Their dual coat protects them in both cold and heat. You will just need to use the common sense approach as it applies to the heat and humidity factors. The Samoyed is less active during the summer months and will want to go outside in the summer months in the very early morning hours or the late night hours. They do get their exercise indoors too. The breed standard describes it as a medium-sized dog of moderate build. Males are noticeably larger than females. Females are 45-51cm at the shoulder, the males are 51-56cm. The Samoyed's coast is a thick double-layered hair coat. It is not a fur coat like common breed dogs and thus tends to have lower allergic reactions. The coat should be thick and requires little washing. Even when coated in mud, after drying the dirt tends to fall off easily or with gentle brushing leaving a white coat underneath. This occurs, as the coast is naturally resilient and repellent. The Samoyeds also do not have a strong smell (common in breeds like cattle dogs and golden retrievers). A Samoyed will only smell if ill (normally from hormonal imbalance or gastric upsets) or if the under coast is left wet for long periods of time. For this reason when washing a Samoyed it is important to dry the thick under coat as quickly as possible, investment into a strong hair dryer or dog blower with a good supply of talcum powder is a great investment when owning a Samoyed. As a Samoyed owner you should be prepared to brush their coat once a week for at least half an hour.